Impressively, my wife was game for the idea too. So, on February 1st, we turned the boiler way down, to 65°F, and started loading the wood stove. To determine if we would love/hate or be impartial to the need to fill the wood stove in the morning and night. To determine if we would be comfortable with the house temperature we could maintain. To determine how much electrical energy we could save by using wood as our primary heat source. First off, I love our wood burning stove from Morso Denmark. And I love fire. Who doesn’t really? Isn’t their something primordial about sitting around a crackling fire with friends and family? We’d had it a mandatory requirement from day one of the house planning that we would have a wood burning stove in the main living space. I’d only ever seen one house with the stove in front of the windows and I think it is a brilliant spot. It doesn’t obstruct our view during the day, but at night the fire gives a nice focal point to the room. This placement also allows it to be viewed from the kitchen, dining room and living room and extend it’s heat range to the bedrooms on the main floor. We have a wood nook directly opposite the wood stove that is 24″x84″x20″ which contains the mess and also adds another interesting feature to the room. But enough about design and aesthetics (although I do want to write about that again sometime), let’s talk about function. My goal was to keep the house around 69°-72°F during the day and a bit cooler at night while we slept. The month of February was an interesting temperature mix. The first week was stupid cold (-30 to -40°F/C). But then typical for SK, it warmed up to above freezing temperatures for mid-month and then dropped to seasonal temperatures for the last week (-15°C or 5°F). This made it actually a very convenient month to test the wood heat giving us a fair bit of variety. The first week (very cold week) we burned through the entire wood storage nook. This was surprising to me as I’d only filled it twice the entire winter beforehand! We were going to use up some wood. Basically what I would do is start a fire when I got up (it was good reason to get up and not to hit the snooze button too). The house temperature was around 66°F or 68°F most mornings. I’d get it hot, then load it up and turn the damper down before work. Passive solar gain would keep the house reasonably warm during the day and when we’d get home the house was usually about 69°F. We’d start the fire again and keep it burning until we went to bed, usually trying to get the house temperature up to around 74°F. Again, I’d load up the stove and turn the damper way down before tucking in. I actually didn’t find this nearly as much work as I thought I would. In fact, I liked it quite a lot. Certainly it’s more work then just getting up and doing nothing, but it really wasn’t bad. By the second and third weeks, we were in our groove, and the outside temperature was mild. We used half as much wood and the house stayed above 70°F most days and nights, which was higher then we’d had the boiler set at before. In the last week, we used a bit more wood again, but it didn’t seem like much work. I ended up loading the wood nook three times for the month in total. We had pine, tamarack, maple and poplar wood that we burned for the month. The pine and tamarack had been what we’d mostly been using for the winter. It’s a soft wood, but has high BTU output, so it burns hot, and also burns quickly. It’s good for a quick warm-up if the house is cooler, but it doesn’t give that prolonged slow burn you might want at night time. It does however burn clean, not giving off a lot of smoke and ash. Maple is a bit better for the prolonged evening slow burn given that it is a hardwood. While the poplar, well, it’s crap. I regret burning it. It’s a dirty wood, very smoky and lots of ash. It’s BTU output is crap too. Oh well. Now I know. OK so for objectives #1 and #2, I realized that I was generally impartial to the work of loading the stove. We loved the wood heat though. It was comforting and, in fact, most days the house was able to stay above the typical 70°F temperature we’d had the boiler set at previously, which was a nice bonus. Some of the really cold days when you’d wake up to 66°F inside were a bit uncomfortable for the first few minutes until the wood stove got things warmed up. Also, I didn’t really want to be in bare feet on the concrete floors. Even though the house would be warm, we generally would wear slippers. Now, the big question was, was the extra time/effort worth the energy savings? First off, I was shocked at the overall energy use! It was a massive drop from the previous year. That’s a 64% drop in electrical energy! Wow. I really did not expect that. And as you can see it’s not like we had an especially sunny month by any means, the solar generation was actually one-third less than last year so we weren’t even getting much passive solar heating. Needless to say, I was very pleased with these results. When I crunched the numbers a bit more, the cost savings were $177.00 (1448 kWh x $0.12224/kWh)! In a single month. That’s awesome. I’ll back up a bit. 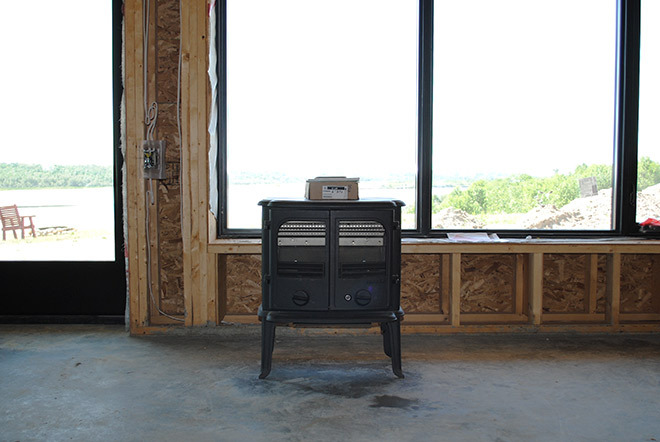 When we were designing and planning the house, the number 1 item that we wanted in our house was a wood burning stove. There is nothing that I enjoy more than sitting in front of a fire on a cool day. I was never entirely sure how to articulate my love for a fire before, that is until while reading our bible on house building, ‘A Pattern Language: A Timeless Way of Building’ by Christopher Alexander, and I came across his chapter on: The Fire. We had followed this pattern language to a ‘T’ when designing our main living space, the fire was the centre point of the room, it could be viewed from the kitchen, dining, and living rooms. There is no need for a TV in a room with a fire. In terms of placement, we sat it squarely in front of our main window – therefore when it is alight we can enjoy the fire, but when it is not then we can look beyond it to our view of the river and valley. 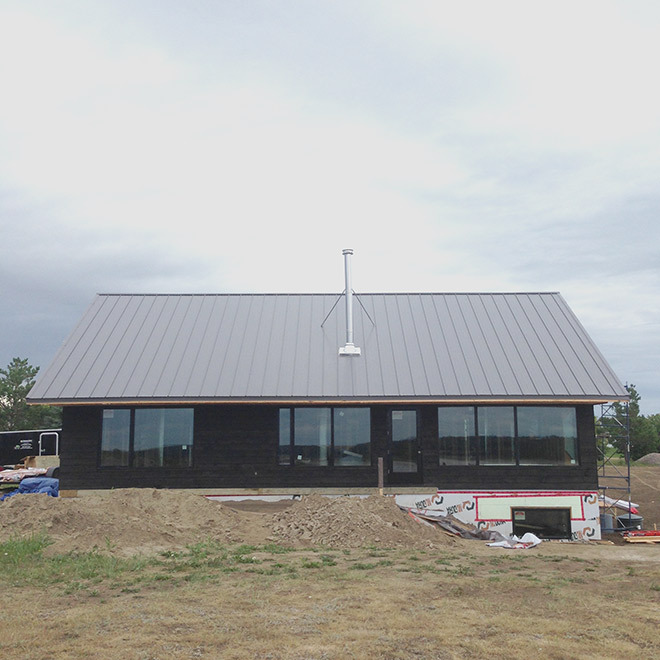 To make this all work, of course, we needed to ensure we had a beautiful but also highly efficient wood stove. We had done a lot of research on this and were most drawn to the Scandinavian stoves – Morso and Jotul in particular (which is not a surprise given our love of Scandinavian design – but they also make damn good stoves). We ended up choosing the Morso 2110 stove simply due to it’s interesting blend of traditional and modern styling, which we are hoping our home will also encompass. It is also sized well for our space, not too big and not to small, and really, although our house will be super-insulated, simply putting less wood in can reduce the risk of overheating. Indeed, having a wood burning stove in a super-insulated house can be considered unnecessary, however for us, 1. we wanted one, and 2. it is important for back up heating in the event of an extended power outage (of which we had had a few in the past winter). We had actually purchased the stove last year, when we found it on sale at a fireplace shop in another city. It’d been sitting in storage since then and I was so excited to have it in place – after all, as you may see, I’d been obsessing about it for months. So in the day following the pouring of the main floor concrete, we hauled the 300 lbs beast onto the main floor and unwrapped it. We had made some calls to our insurance company previously (who don’t like fire like I do), as you may guess your insurance premiums go up with a wood burning stove, but they also require that you have it installed by a “WETT (wood energy technology transfer) certified professional.” We found a company in town, Wheatland Fireplace, that had these certified installers and also sold the top-rated chimney and stove pipe, ICC Excel and Ultrablack. Because I was paranoid and protective of the freshly completed concrete floors and that the stove be positioned precisely in front of the window, my contractor and I measured, levelled and positioned the stove so that the installers would not need to move the stove at all. I called them in the morning to tell them so and to NOT TO MOVE IT. My contractor, who was there as well told them to be “very careful” as the floors were finished. And wouldn’t you know it, when I got home, this is what I found: a nice deep gouge and scratch right in front of the legs of the stove. 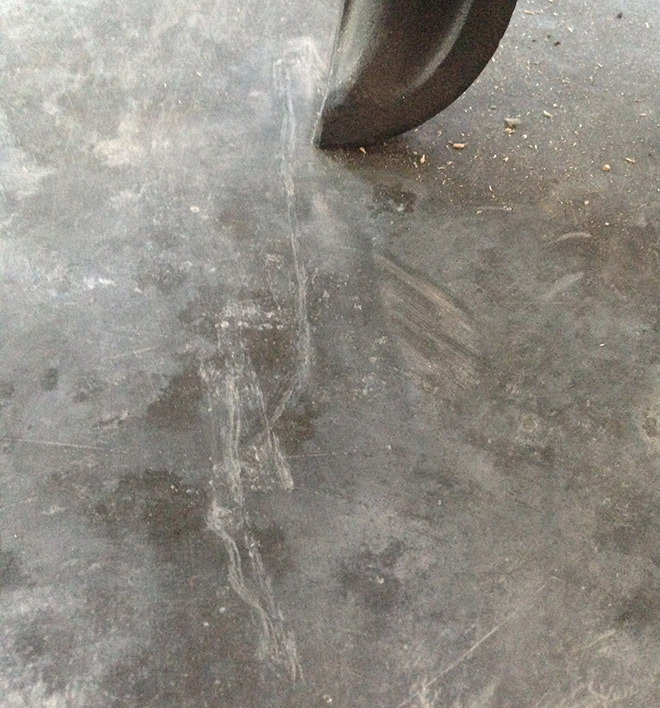 I called the company immediately, although they were closed for the weekend, “I’m not sure what part of DON’T MOVE the stove you didn’t understand.” Of course this being a finished concrete floor, there is no way to remove this scratch. It may lighten when we seal it and polish it or it may become more noticeable – either way, I was not happy. Yes, that is daylight coming through. I’m going to venture a guess and say that daylight coming through the roof is not a good thing. I climbed up on the ladder for a closer look and found that they had attempted to fill a 1/4″ gap with silicone! That just seemed crazy to me – these are professionals? And as if that wasn’t enough, that red band of tape that says “do not place insulation above this line”, was positioned about 10″ from the joists. We are placing 20″ of insulation in the attic. Ok breathe, it is the weekend and nothing can be done until Monday. Over the weekend we covered all of the floors, upstairs and down with Ram Board, a temporary cardboard-type floor protector and wrapped the stove in bubblewrap and a blanket. As fate would have it, on Sunday night we had a massive rain storm, almost 3″ of rain fell over the next 24 hours, I barely slept as I feared what I might wake up to when I got to the house in the morning. I arrived only to find water running down the shoddily installed chimney pipe, streaming onto the stove and puddling on the floor! I frantically wiped the floors with towels and pulled the blankets off of the stove. The Ram Board had miraculously done it’s job (thank god) in protecting the floors and the bubblewrap had preventing any water from entering or pooling on the stove itself. I left a garbage bucket on the stove to collect the water (it had to be dumped twice during the day). Furious, I called the chimney installers, I was shocked at the nonchalant response to my concern of water pouring into the house. “We will be there in the next couple days,” they told me. No, you will be here today, I told them, this is a crisis. Of course, they did not show up that day or the next. On the third day the same installers returned – with more caulking in hand! I told my contractor to go on the roof and spray it with a hose to test it before they ;eft. After adding more caulking they sprayed it down while the watched the water continue to run down into house. So, naturally, what did the installers do? They drove to the city to get better caulking! Oh my god, I couldn’t believe it. More caulking was not the solution. But they told us they “guaranteed” this would work. Best stuff. Leave it for two days, then test it again. I was obviously skeptical, but I waited the two days, in fact, I waited three days, and tested it with a light shower of water – shockingly, water continued to run in the house. I called them again and said that this was not acceptable. They need to replace and install the system – it was clearly not installed correctly and MORE CAULKING was not the solution (besides that when I was up on the roof looking at the gap, they must have used at least an entire tube of the stuff, it was glopped everywhere and was actually running down the roof, what a mess). Over the next week, I was told on four separate occasions that the head installer was coming out the next day – he did not show up any of these days. Finally on the fifth day the head installer finally showed up (really at the last minute as that afternoon it rained another 2 inches). I found out later that he was actually the only WETT certified installer with the company, the other two guys who’d come before were not. One of them had only been working there for a month. 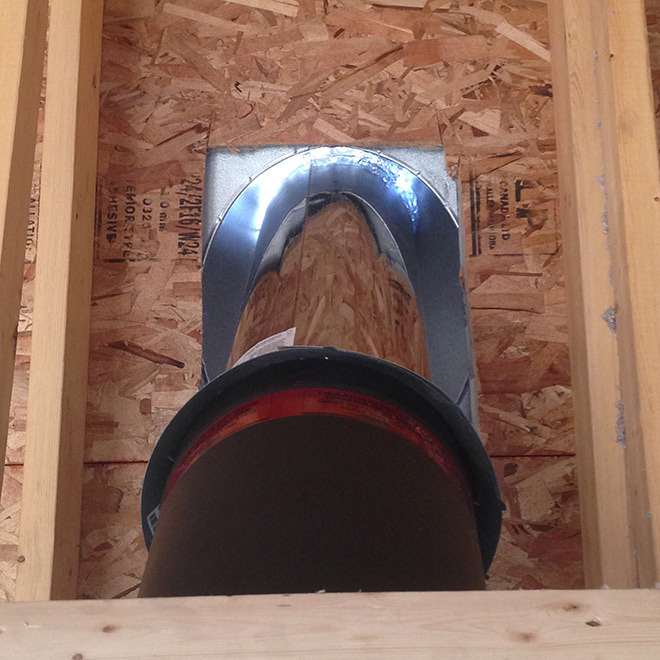 The head installer was able to fix the problem by tightening the storm collar and repositioning the flashing. The rain tested it out and it did not leak. In hindsight, I am actually grateful that it happened to rain two days after the initial “installation.” Could you imagine if it hadn’t rained until a month later when the attic insulation was done and the ceiling was sealed off? We wouldn’t have known for months that it was leaking – until we started to notice a mildew smell or rotting of the pine ceiling. Oh, what a nightmare that would have been.